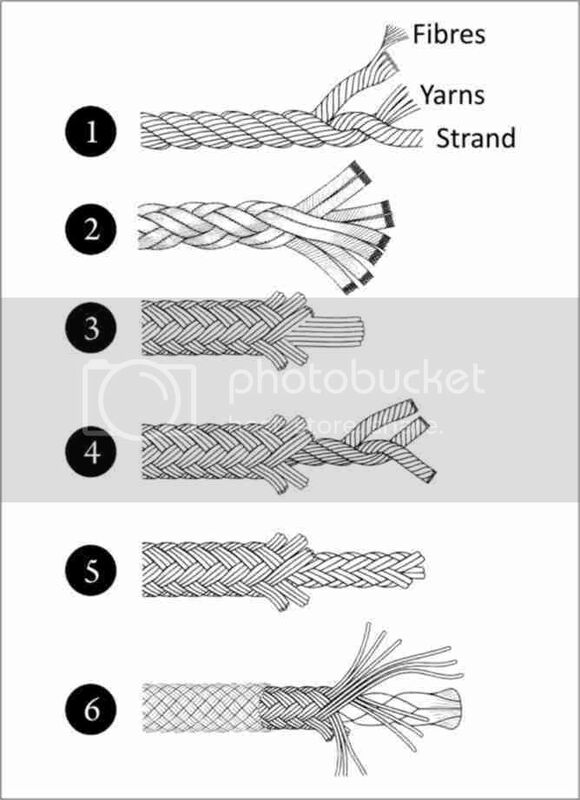 A three-strand rope (1) spirals clockwise, as it goes away from you , the strands having a lay that is right-handed. craftworkers prefer the terms Z-laid. sailors call such a rope a hawser and so it is hawser-laid. the individual strands are twisted left-handed (s-laid) and the yarns of each strands, which makes it more flexible (although no stronger), but it then has a hollow core, which must be filled with a heart of yarns. Hearts may be laid, unlaid or braided. Rope, cord, string and twines were once all made from the shredded and combed fibres of plant and hemp were the renewable and eco-friendly crops from which vegetable-fibre ropes were made. These natural -fibre ropes had character- conjured up by soft white cotton aboard smart yachts. but they could be hard on the hands and all the cordage was, by today's standard, weak. Strength only came with cumbersome circumferences. natural-fibre rope was somewhat stronger when wet (as are synthetics ) but then it tended to rot. Natural-fibre ropes have been replaced almost entirely by modern synthetics. Nylon is marketed under trade names such as Polyamid, Brinylon and Enkalon. polyester appears as Terylene, Dacron, Tergal and Fortrel. The expensive organic polymer aramid is sold as Kevlar. then there is cheaper polyproplyne. newer products include Dyneema,Spectra and Admiral 200. A competent suplier will sort out what you need, but basically nylon streches and so is suitable for anchor warps or tow lines where some give is crucial, whereas Terylene does not and is used for standing ringging and in any other case where stretch unwanted. Kevlar has a remarkable strength-to-weight ratio and can replace wire ringing, but it can be easily damaged by abrasion and must be sheathed in tough polyester. Weaker, lighter cordage (e.g., polypropylene) may float and make a useful heaving line. man-made cordage come in many colours, so it is now usual to colour code yacht halyards and sheets, or merely to follow fashion in ringging a sail board or canoe. The problem with man-made fibre ropes, spun from monofilaments, is that they smooth and slippery, with less grip, and trusted knots may perform badly in them. the usual advice is to add a half-hitch or two for extra security; the long-term answer may be to come up with more suitable knots. Some manufacturers chop their long monofilaments into shorter staple lengths, which recreates the hairy surface texture of rope originally made from leaves and stalks and roots plants.